Ammann's RSS 120-M Shredder, Iron Separator and Screener. Ammann recently began distribution of asphalt-mixing plants in North America. Key products include the ABP HRT High Recycling Technology Plant, the ACM Prime Asphalt-Mixing Plant and RSS 120-M Shredder. The ABP HRT plant is an ideal fit for asphalt manufacturers who need to incorporate large proportions of RAP without sacrificing production capacity and quality. The HRT is a "two-in-one" plant featuring both warm and cold recycling systems that can be used simultaneously. There are two warm recycling systems to choose from. One is the conventional concurrent flow dryer for RAP additions of up to 60 percent. The second is Ammann's latest development in warm recycling, the RAH100, which can utilize 100 percent RAP. The ACM Prime Asphalt-Mixing Plant is ideal for completing a number of small jobs in varied locations and where frequent transport is required. It is an ideal initial acquisition for paving contractors looking to introduce asphalt production into their businesses. The ACM 140 Prime offers output of up to 154 U.S. short tons per hour. It is engineered for smaller volumes and therefore produces them efficiently, delivering cost savings in fuel and electrical energy consumption. Recycled asphalt can be utilized with this plant. The entire plant and three cold feeder bins fit on two axles during transport. The RSS 120-M Shredder, Iron Separator and Screener is a mobile machine that prepares RAP for use in an asphalt plant. The shredder's crushing system maintains desired grain sizes, which is important because it dramatically reduces the fines that make RAP sticky and difficult to work with. This compact, 120-tph plant from Asphalt Drum Mixers features single-drum counterflow technology. The EX120 asphalt plant will be shown by Asphalt Drum Mixers as a solution for producers who need a portable counterflow plant that can process high percentages of RAP - as much as 50 percent. This compact, 120-tph plant features single-drum counterflow technology. Counterflow technology with separate drying and mixing zones allows the EX120 to achieve maximum heat transfer and fuel efficiency. The system virtually eliminates unsafe carbon emissions that are a common problem with drum mix plants. ADM further reduces emissions by designing the counterflow system to reintroduce gases back to the drum's combustion zone. Engineers designed the EX Series for smaller output and optimal transport. The entire EX120 plant sits on one chassis for easy movement from site to site. In addition, one plant operator and one loader operator can control the EX120. Bomag's most powerful cold milling machine is the BM 2200/75. Bomag will display its most powerful cold milling machine, the BM 2200/75. With its 760.3-hp (567-kW) diesel engine, the BM 2200/75 delivers high-performance milling of half-lane widths reaching 86.6 inches (2,200 mm) at depths of up to 13.8 inches (350 mm). A range of quick-change milling drum options – from fine to standard to power for tough applications – are available to meet specific jobsite requirements. A 35.4-inch-wide (900-mm) conveyer system quickly channels material from the cutting chamber and hydraulically folds for efficient transportation. The upper conveyor swivels 60 degrees left or right of centre, allowing the mill to efficiently discharge material to either side of the machine. Bomag's unique BMS 15 milling tooth holder design delivers superior productivity; the company says that this extends service life by up to 30 percent over other systems. Its quick-change tooth design requires approximately 25 percent of the time required to change the teeth of conventional systems. The new Caterpillar PM822 Cold Planer. The new Caterpillar PM822 Cold Planer is a highly productive, highly maneuverable half-lane milling machine capable of controlled full-depth removal of asphalt and concrete pavements in a single pass. Operating weights for the new models range from 36,130 to 37,500 kg (79,630 to 82,650 pounds), and cutting widths from 2,010 to 2,505 mm (79 to 98.6 inches). The new machine uses the Cat C18 ACERT engine rated at 563 kW (755 hp), meeting EPA Tier 4 Final emission standards, and is iso-mounted to reduce vibration. 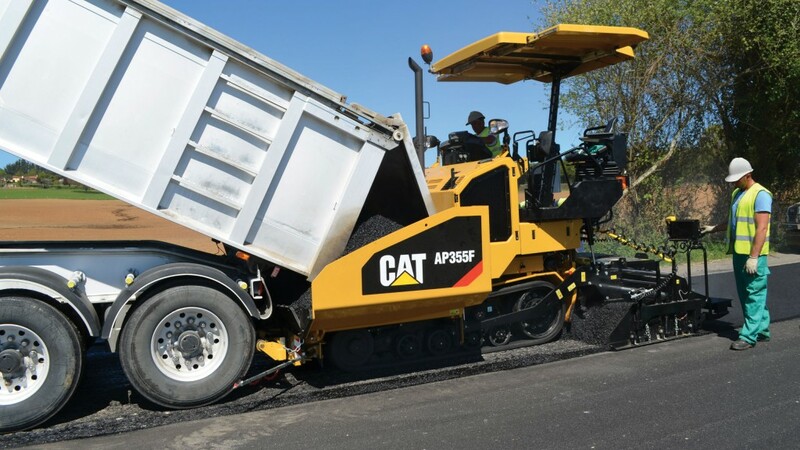 Also on display will be the AP355F Asphalt Paver, which is designed for efficient production in mid-sized applications, including parking lots, urban streets, cycling and walking paths, trenches, and narrow shoulders. The AP300F and AP355F are equipped with new electrically heated SE34 Series screeds, available in vibration-only and vibration/tamper-bar configurations. These pavers also feature engine Eco-Mode, auto-fill feeder system, single-touch feeder system activation and automated travel mode. End of Waste Foundation Inc., a public-service corporation based in California, attended ISRI2019 Convention and Exposition in Los Angeles, held April 8th-11th, 2019. With rising concerns with global warming, End of Waste's first traceability software, based on blockchain technology, is providing a tangible solution to what the company calls a broken system in the recycling industry. Material handler specialist Fuchs is showing a MHL 370 F2 on booth A5 at ISRI 2019—the world's largest scrap recycling industry exhibition, this week from April 9-10, 2019. Within the automotive recycling industry there is growing concern about future economic developments, according to a survey of participants at the International Automobile Recycling Congress, IARC 2019, taking place this week, March 20-22, in Vienna. The survey shows that around 38 per cent expect economic conditions for the automotive recycling industry to deteriorate over the next two years. A similarly high percentage, however, think business will remain stable. Only just over one quarter of those surveyed expect economic conditions to improve. Rotochopper owners and operators gathered at Rotochopper's manufacturing facility in St. Martin, MN for training the last two weeks of February. The customer service department hosts Rotochopper University annually for companies that have purchased Rotochopper grinders during the past year. Global Recycling Day 2019 is today, March 18, and people around the world are joining in the celebrations to mark the day. With events from beach clean ups to high school litter picks, and football challenges to school visits taking place in Europe, Asia, Africa, North America and South America, every corner of the globe is uniting to celebrate the importance of recycling. Refuse and recyclable material collectors rank fifth on the U.S. Department of Labor's Bureau of Labor Statistics' list of most dangerous jobs. In 2017, the National Census of Fatal Occupational Injuries identified 30 fatalities among these collectors. This year, in January alone, 17 fatal incidents have occurred in the solid waste industry in the United States and Canada, with two taking place in New York. Building on its reputation as the premier recycling industry event in the world, the Institute of Scrap Recycling Industries (ISRI) 2019 Convention & Exposition will add a Residential Recycling Summit to its lineup of educational workshops. Through a seven sessions it will deep dive into the issues surround plastics, paper and residential recycling industries. In June, the Recycling Council of Ontario (RCO) is hosting a first-of-its-kind Circular Procurement Summit, over three days, from June 11-13, at the Sheraton Centre Toronto Hotel. The conference aims to unite all levels of government, suppliers and vendors, and experts from leading jurisdictions to ignite the transition to the circular economy in cities and regions across Canada. McCloskey Washing Systems (MWS) held their first North American Open Day at H&H Stone LLC in Bolingbrook, Illinois, from June 20 to 21. The event highlighted new washing and classifying equipment for both quarrying and recycling applications. Intermat visitors will have a chance to view the most recent addition to McCloskey International's product portfolio, the I34R compact impact crusher, during Intermat. This exciting new highly mobile machine will be on display outside the entrance to Hall 6 for the duration of the show. Keestrack will unveil a new design for its track-mounted impact crusher unit R3 / R3e at Intermat (Stand No. : 5A H098). Thanks to its compact transport and operational dimensions, the 30-tonne model offers all advantages of the diesel-electric hybrid concept, which Keestrack is implementing as an efficient alternative drive system in more and more product ranges of its mobile crushing and screening plants.